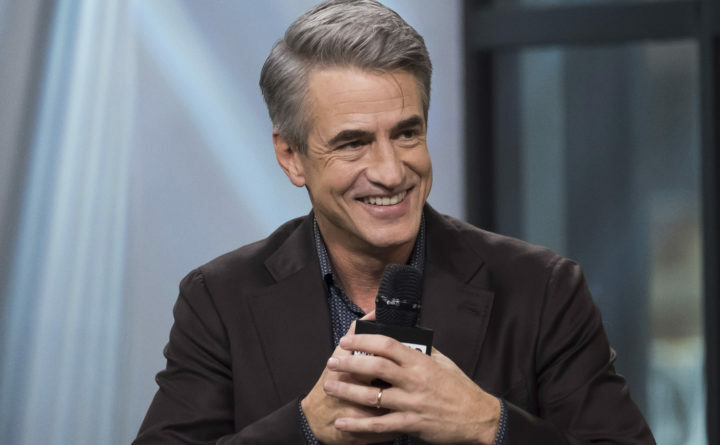 Dermot Mulroney stars in the Hallmark Hall of Fame movie "The Christmas Train." Hallmark airs Christmas movies round-the-clock during the holiday season. If there’s comfort in the familiar, that makes the formulaic — and wildly popular — Hallmark Christmas movies the cozy sweatpants of winter television. And because we’re talking Hallmark Christmas movies here, the recommended beverage is, of course, hot chocolate. If you’d like to spike it with a little Kahlua or bourbon, we can’t be responsible for what happens. — If the main plot of the movie takes place in a small town, take one drink. If that small town is in New England, take another drink. — Is one of the main characters an outsider who ends up in that town by accident or because of an obligation? Drink up. If that obligation is a Christmas wedding, drink again. — Has someone lost their Christmas spirit? Take a drink. If they lost their Christmas spirit because their “love” broke up with them on Christmas, take a drink. If it’s because their “love” died at Christmas, drink. If it’s because a parent left when they were a kid — at Christmas — drink again. If it’s because they accidentally killed their brother while ice skating at Christmas, you’re watching a repeat of the Harry Connick Jr. one (“Angels Sing,” 2013), which may or may not even be a Hallmark movie, but it’s so good. — Speaking of … does someone die in the movie? This is rare and deserves four good drinks. — If there’s magic involved — a magical stocking, magical ornaments, a magical snow globe, guardian angel, etc. — take two drinks. — If the primary male love interest is a farmer, carpenter or just someone who works with his hands, take a drink. If he drives a pickup truck or jeep, take another drink. If he wears flannel, then … never mind, we don’t want you to die. — Is there an African-American best friend or assistant? Two good drinks. — If one of the main characters is a handsome/beautiful single dad or mom, take two drinks. If the mom or dad is single because their spouse died tragically, take another drink. If that spouse died near Christmas time, take another drink. If the little kid from this union is a horrible brat, check your channel because you’re not watching Hallmark. — If the adorable kid in the movie is a niece or nephew, take two drinks. — If a baking contest is part of the plot, take a drink. If it’s ice-sculpting, take two drinks. If the main character loses the contest, three drinks. — Does one of the main stars have a dog? Drink. A cat? Two drinks. — Are the main characters in the movie old high school sweethearts who drifted apart? Take a drink. Was it an ugly breakup? Juicy! Two drinks. — If there’s a ghost of some kind, take three drinks. Then email me to tell me the name of this one. — Do you recognize one of the actors from an old TV show? Drink. Is it from another Hallmark movie? Drink. Did you just Google that person? Drink. Are they Canadian? Drink! — Does the small town in the movie have a big festival, Christmas parade or holiday show for which they are famous? Drink. Is that festival, parade or show in danger of not happening this year? Take another drink. If it’s because of a blizzard, drink again. How do you feel? Pull yourself together because another movie starts in two minutes.